Incredipede is a puzzle game being made by a small team headed by Colin Northway, author of Fantastic Contraption. The game follows Quozzle, a lone Incredipede on a quest to rescue her sisters. She has a unique ability to grow new arms and legs wherever she needs them, transforming into a snake, a spider, a horse, a monkey - anything you can imagine. You can give her antlers or a tail, use nature as a blueprint or strike out in weird new directions. You have to control Quozzle as she learns to swing through the trees, climb sheer cliffs, dance over rivers of lava, and even soar through the air on thermal winds. 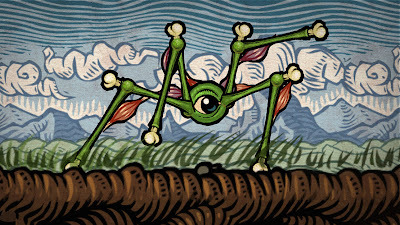 Incredipede features 60 levels in three beautifully crafted worlds. The first world introduces placing muscles and controlling Quozzle using the keyboard. Further worlds give you full control over Quozzle's limbs, as you stretch her into new shapes to better navigate her surroundings. Long arms can reach up high to grab ledges, while many feet make for faster crossing over dangerous terrain. It doesn't end there. You can use the level editor to create your own puzzles, or challenge others to control your Quozzle designs to the finish line. Browse user-made levels and creatures, and experience the vast diversity of human creativity. Incredipede will be released in October on Windows, Mac and Linux platforms.